The church was probably erected over the ruins of an earlier structure, of the transitional cross-in-square type. Inscribed plaques built into the west wall, over the entrance, record that the church was renovated in 1065 A.D. by Nicolaos Calomalos. 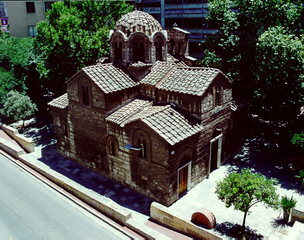 It was seriously damaged during the Greek Revolution in 1821 but was restored in 1840. The sanctuary and the ambo of the church have been restored. Simple, two-column, cross-in-square church with a narthex and a dome supported by sections of walls. The east side ends at three apses, of which the middle one is larger. The bell-tower of the south side is a later addition. The walls are built in the typical cloisonne masonry and are decorated with brick, Cufic ornaments. The wall paintings of the interior are dated to the 19th century.